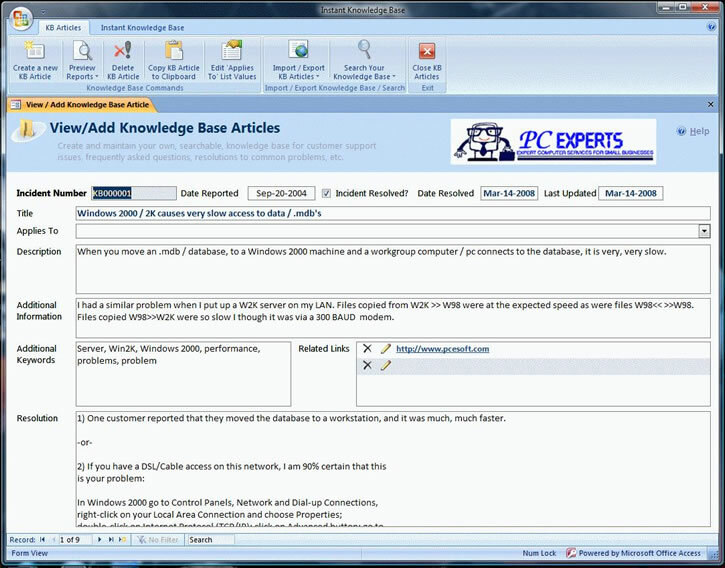 Instant Knowledge Base is a new, powerful help-desk database program that allows you to enter, and maintain, your own custom knowledge base articles and to-do lists. Your knowledge base is fully searchable, using our state of the art search technology. Perfect for Help-Desk applications and perfect for anyone who wants to track information that can be searched. Statement: First, please download the orginal installation package by clicking the download link. Of course you may also download it from the publisher's website. Using Instant Knowledge Base crack, key, patch, serial number, registration code, keygen is illegal. The download file hosted at publisher website. We do not provide any download link points to Rapidshare, Hotfile, Depositfiles, Mediafire, Filefactory, etc. or obtained from file sharing programs such as Limewire, Kazaa, Imesh, Ares, BearShare, BitTorrent, WinMX etc. Software piracy is theft. If you like Instant Knowledge Base please buy it.